I'm wearing 3 coats with a coat of SV. Sorry for the tip shrinkage I washed my hands a lot the day before. You can really see the brown tones under the Ott-Lite here. It definitely looks much darker in person (like in the above flash pic lol). I also got this out of that 3.75 clearance bin, I guess this is soooo 2009, pfft! I really wanted to get Smitten with Mittens I think is called but haven't seen it anywhere in town yet. Soooo Nicole from Magic Maid tagged me with What's in your fridge. I was so excited because I had the funniest magnet to show you! Can you spot the funny magnet? So here is my fridge, it's nothing special, hummmm you can tell we like take out lol. It's kind of embarassing so please forget the clutter of menus and coupons! I think the Pizza Hut in Anchorage mailed these out in 1999. I'm not sure if they sent it or they paid for the other side of the advertising (the back is the pizza hut #) or not but clearly the winner is this y2k hotline! Okay so am I the only one that finds this magnet pretty funny? Thanks Nicole that was fun lol. Shayla - I tag you! Great polish, and I love how your fridge looks! 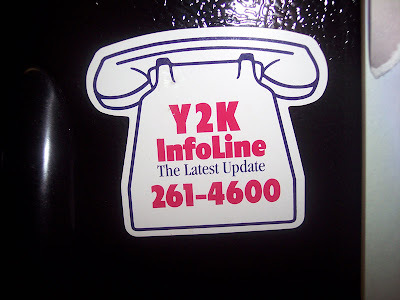 Hahaha, Y2K hotline! That's AWESOME. It's even more awesome you still have it! Rocks. I love this color Kae, it was so pretty I accidentally bought two of them. Haha. I haven't seen Smitten With Mittens anywhere either. The polish is pretty, and I love the Y2K magnet. It makes me remember all the craziness surrounding the new millennium - I think some people thought the world was going to explode. Pretty nail polish! 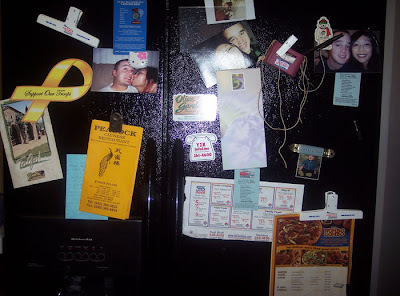 I have lots of menus on my fridge too and LOL at that Y2K magnet! Love this color on you. Funny magnet! I so remember 1999 new years eve. I was pregnant,my daughter was born in June 2000. And I was so worried with what might happen when 2000 rolled around....lol....so silly of me! Nicole - haha yeah I'm gonna keep it forever! I love it too, well good luck to both of us finding Smittens! Shayla - lol lots of good food comes out of your fridge I had to do it! Yeah people buying months supply of food and water and the computers all not working anymore, crazy! That is a funny magnet, haha. I like your swatch of this, I never liked it really before I saw yours. that magnet is HILARIOUS! i remember how nervous everyone was! This looks really pretty on you. Don't make me buy it! You really keep your magnets awhile.